In America it has become standard for large public research universities, small liberal arts colleges, and everything in between to require students to complete general education and distribution requirements that have little to nothing to do with their major area of study. This means that if you are an Engineering major you may still need to take a course in the social sciences in order to earn your degree. If you are Math major you may still need to take a required diversity course to meet graduation requirements. If you are an Economics major you may still need to fulfill a foreign language requirement before you receive your diploma. You get the idea. Taking even a few required courses that you have no interest in adds up fast – so fast that soon you find yourself paying for an entire year of tuition that has nothing to do with your intended career or major area of interest. In Europe, especially in England, every class you take will be in your major (or as they call it, course) area. If you are studying History, every course you take will be related to History. If you want to immerse yourself in Business, all courses you take from day one until the day you graduate will educate you about business. Male students in particular are often not as inclined to multitask as female students; therefore, men, pay attention: England’s style of higher education is best suited for the student who knows exactly what he (or she) wants to study and who does not want to mess around with subjects that are tangential to his (or her) goals. It’s one thing to get a broad-based education in high school; college is arguably the ideal time to focus on a very narrow subject deeply. Sadly, most undergraduate institutions in the U.S. don’t permit students to delve as deeply and fully into subject areas as their counterparts in England because of the many other academic requirements U.S. colleges and universities place upon their students. The retail price of Europe’s top universities is often far less than the retail price of tuition at America’s top universities. In many cases college is free to European citizens, which promotes great economic diversity of students attending European universities. In addition, many universities in England and throughout Europe participate in the U.S. Federal Student Aid Program, which allows American students to take out loans similar to the ones they would be taking out to attend U.S. colleges anyway. In Germany, college is essentially free to all non-citizens – even Americans, and one may not even need to learn German to study in Germany, as increasingly entire undergraduate degree programs in Germany are offered in English. If you are studying in a big American city you can of course go out to dinner at a great French restaurant or hit up the clubs in the trendy part of town. If you are studying in London, you can spend your entire weekend in Paris, Budapest, or Seville. In Europe, centuries worth of the culture and history of Western Civilization beckon around nearly every corner. While the U.S. is fascinating and filled with important sites and dynamic culture, if you are from the U.S., college is an ideal time when you could be exposing yourself to a life unlike any you have experienced in the past or will experience again in the future. Europe offers you just this sort of experience. While many American colleges boast of diversity when pointing to the race, state of residence, or country of citizenship of their students, it is obvious to anyone who looks at the situation critically that such diversity is often superficial at best. At top American colleges especially, no matter a student’s race, state of residence, or country of citizenship, he or she is far more likely to be a son or daughter of a doctor, lawyer, investment banker, politician, or owner of a major company than he or she is to be the son or daughter of a farmer, factory worker, waitress, construction worker, or truck driver. Your college years should be the time to gain exposure to a greater diversity of people and perspectives than you ever could gain exposure to in high school or may ever be able to have access to again upon entering the world of work. Studying in Europe will allow you to do just that, as European universities attract students from all economic levels and all corners of the Earth because of their relative affordability and quality. If you are studying in a small town in the U.S. your most likely social options each weekend will consist of getting drunk or staying sober in the dorms or off-campus with middle or upper class peers. As mentioned previously, in Europe, university students often come from a greater number of countries, cultures, and classes, and these individuals’ ideal diversions often does not come in the form of getting drunk at frat parties or at pre-game or post-game parties on and around campus. If you have had any social life in high school, college social life in the U.S. has a very real feeling of ‘been there, done that’ with a splash of greater excess. European students’ ideal form of socialization is on average more sophisticated than that of their peers in the U.S. both because of Europe’s lower legal drinking ages and more diverse social preferences. 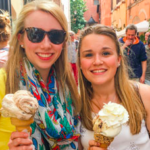 Going to college in Europe often means attending class with and living nearby students who are more focused on their academic and professional goals and who socialize in myriad ways that average American students would never even consider on their college campuses. Europe is not for everyone; however, if you find yourself unhappy with or underwhelmed by your undergraduate study options in the U.S., you should seriously consider crossing the pond and challenging yourself to a style of education and a social environment utterly distinct from what you would likely experience at most colleges and universities in the U.S.